Don’t wear your favorite clothes to Soot Bull Jeep. Koreatown’s O.G. barbecue destination is the last spot in town that powers its tabletop grills with hardwood charcoal, lending unrivaled smokiness to the meat and occasionally sending live embers flying toward your chinos. Flashier competitors promise better ventilation and premium cuts, but only Soot Bull Jeep transports you to a bustling Seoul side street. How to do it: Start with an order of marinated galbi (short ribs) and a bottle of soju. Repeat as needed. RELATED: The 14 Must-Try Korean Barbecue Restaurants in L.A. Spread over five acres of Santa Monica seashore, the Annenberg Community Beach House offers the glam of a private Palisades club with none of the frivolous exclusivity. Hang in the guesthouse of Going Hollywood starlet Marion Davies before heading to the spiffy pool complex. Splash pads and volleyball courts should keep the fam more than occupied. How to do it: Summer temps draw crowds, and pool passes are limited, so guarantee yourself a spot by making a reservation online at apm.activecommunities.com. L.A. has no shortage of fireworks shows on the Fourth, but only one takes place with the DTLA skyline as a backdrop. This year’s Fourth of July Block Party at Grand Park featured two live stages and attracted 48,000 revelers. How to do it: Avoid the idling traffic and take the Red Line to claim a spot early (if that’s your thing). 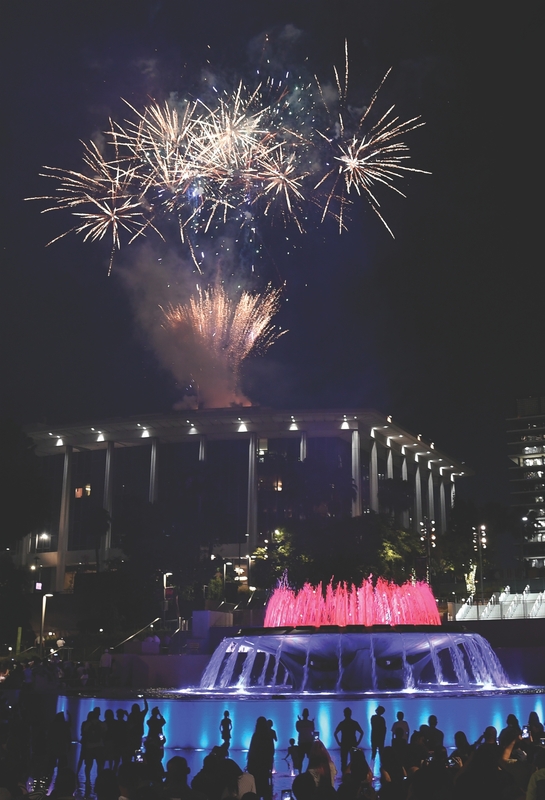 Come 9 p.m. all eyes turn toward Dorothy Chandler Pavilion—you’ve got a front-row seat to 15 minutes of spectacular pyrotechnics. Did you know? Grand Park is a serious hub for cultural programming. Aside from its annual Fourth of July fête, the green space hosts scads of events year-round. Bookmark its calendar to stay up to date on everything from Dance DTLA nights and pop-up art installations to events with the Music Center and summertime boot camps. The briny Redondo Beach mainstay has been around for more than six decades, thanks in no small part to its one exceptional cocktail. How to do it: Clamber up to the kitschy crow’s nest bar for a Fire Chief mai tai served in one of those Tony’s souvenir glasses that clutter the cupboards of any true South Bay denizen. The chaser of panoramic ocean views? On the house. Once you exit the 10 and are traveling up Pacific Coast Highway, you’ll remember why this drive is on so many “best of ” lists. So take it slow as you cruise to County Line Beach for some beer-battered fish and chips. How to do it: The ramshackle, touristy fave is pretty much always packed. Snag a table (Be! Aggressive! Be-e aggressive! ), order up, and partake in the age-old L.A. pastime of people watching. Hop on a TMZ tour and you might get a drive-by glimpse of the Biebs and his betrothed, but you can enjoy a more relaxed (and more delicious) attempt at scoping celebs in their natural habitat by dining at the Chateau Marmont’s tranquil poolside restaurant. How to do it: Book a brunch reservation at the Hollywood Hills hotel on a weekend and you’ll be perfectly poised for a stakeout; chances are you’ll see at least one famous mug. 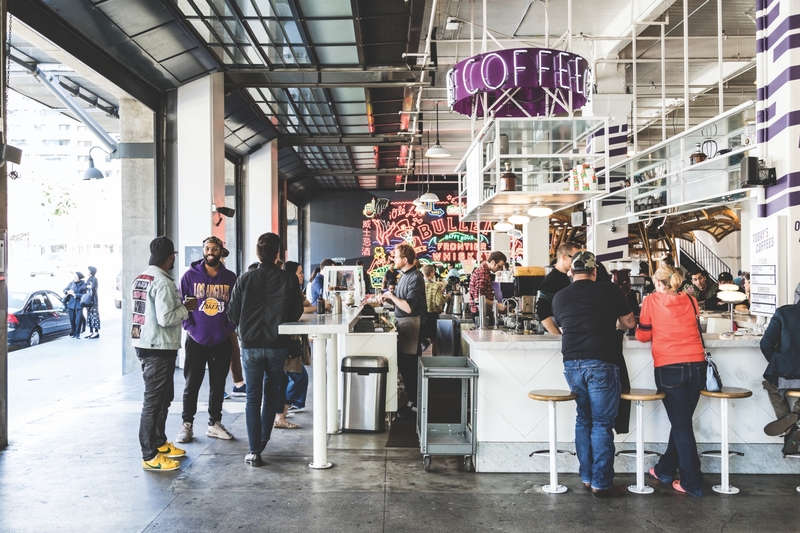 The asada at Tacos Tumbras a Tomas and falafel from Madcapra make the DTLA open-air food hall a draw year-round. But late-night summer hours paired with extra programming might inspire you to visit more often. How to do it: Go for dinner—or dessert at McConnell’s—then stick around for a Grand Central jazz concert or an eclectic performance from a Dublab DJ. Check the calendar for events. 95. Catch a Concert at Jimmy Kimmel Live! Corden, Conan, Kimmel, Ellen—talk show tapings abound, but Jimmy Kimmel ups the ante with his outdoor concert series. How to do it: Find out who’s on tap at 1iota.com, book free tickets, and you’ll be treated to a set behind the host’s Hollywood and Highland studios. You don’t have to show up as early as they tell you to (3:30 p.m.), but the higher up in line, the closer you’ll be to the stage. The eternal resting place of Michael Jackson, Elizabeth Taylor, and Walt Disney is more than a burial ground. The Great Mausoleum alone has 11 levels, with stained glass, exact replicas of Michelangelo’s works, and the world’s largest religious painting, while the compact museum has featured everything from photographs of David Bowie to (right now) World Cup memorabilia. How to do it: The free art hub is open to the public Tuesdays to Sundays from 10 a.m. to 5 p.m. Want to see famous headstones while you’re there? Take note: The Glendale cemetery doesn’t offer star maps, so search findagrave.com before your visit. No one can dog you for being selfie-indulgent on a proper holiday, so on June 21 head to some of our most photogenic locales: the pink Paul Smith wall in WeHo, the “Hello” wall in Beverly Grove, and the polka dot wall downtown. You can have bubbly two ways at the Ritz-Carlton spa: In a flute and on your body. The DTLA hotel’s 80-minute Champagne & Shimmer experience ($260) uses champagne seeds and oils to soothe your skin after an all-over scrub. Once your rough bits are smooth, it’s time to bliss out during a massage. A final dusting of 24 karat gold shimmer powder ensures that your outer glow matches your inner one. The Ocean Prelude Treatment at Terranea: At the Rancho Palos Verdes resort, you’ll be dry brushed, wrapped in seaweed, and massaged—all above the Pacific. La Vie en Rose Power Facial at Angela Caglia Skin Spa: The celeb-approved option at this Bel-Air-adjacent oasis features microcurrent massage, a peel, and other indulgences. Tomoko Massage at Tomoko Japanese Spa: Book an early evening couples massage at the serene Beverly Hills retreat, then stay for dinner. On the menu: Sushi from Sugarfish. Climb aboard that beautiful bird, then stick around and explore the neighborhood. 10:15 a.m. Share a churro waffle at the Semi-Tropic before grabbing a latte at VanillaBlack on your walk to Echo Park Lake. 12 p.m. 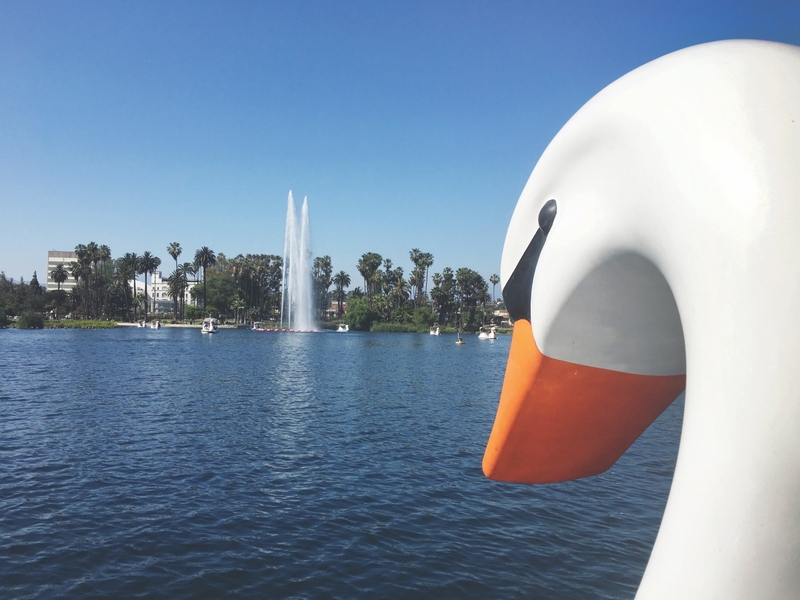 Enjoy the life aquatic aboard a swan boat, available by the hour from Wheel Fun Rentals. The spires of downtown can be seen on the horizon as you pedal your way around the lake’s lilies, lotuses, and fountains. 3:30 p.m. Hit the shops along Sunset for apparel from Gingerly Witty, vintage decor from Nico & Bullitt, and reading material from Stories Books & Café. 6:30 p.m. Finish off the day by going halfsies on the grilled banana sundae at Ostrich Farm. A number of legendary architects have left their mark on our city. Time for a firsthand encounter. Stahl House: The icon that Pierre Koenig designed for the Case Study House program in 1959 may well offer L.A.’s most spectacular house tour: Book an evening slot ($90 for one person, $50 each for two) and you can cozy up in a midcentury armchair to gaze out over the glimmering expanse of the city through the floor-to-ceiling glass walls before dipping a toe in the cliff-top pool. 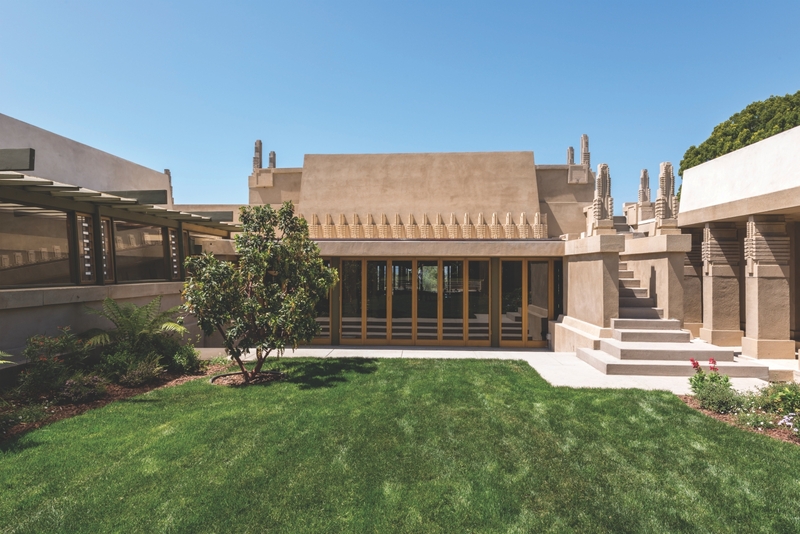 Hollyhock House (pictured): Every Friday from the end of May through August, Barnsdall Art Park hosts an evening of wine tasting, food trucks, and music on the lawn outside the Frank Lloyd Wright-designed Hollyhock House—so dubbed for the abstract floral motifs incorporated into the building’s roofline and walls. Tours of the temple-like space (best enjoyed while moderately tipsy) are available for $15 if reserved in advance, and the sprawling grounds are yours to explore. Ennis House: Wright’s final and greatest L.A.-area textile-block house was designed to turn concrete—the “ugliest thing in the building world,” according to the architect—into something noble and beautiful. Finally restored by billionaire Ron Burkle after decades of deterioration, the house went on the market in July for $23 million with the stipulation that the buyer keep it open to the public at least 12 days a year. Once a new owner is in place, interior tours will be reinstated. Eames House: Conceived by designers Charles and Ray Eames as a welcoming and “unselfconscious” space, the elegantly simple Pacific Palisades home is proof that a prefab structure can feel inviting. The house is presented exactly as the couple left it—full of artwork, baskets, books, and the furniture they designed. It’s not cheap, but $750 will buy you and three of your friends a catered picnic on the meadow-like grounds, as well as private access to the home and studio.